The Tinamba Hotel has been named one of the top 50 restaurants in Australia for 2017. 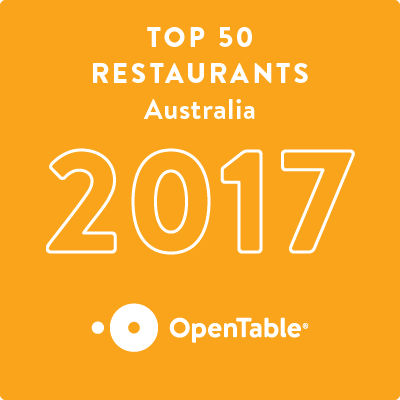 We are so pleased to announce that we’ve been named one of OpenTable’s top 50 restaurants 2017 by Australian diners. The honour is determined by more than 70,000 verified reviews submitted by OpenTable diners over the last year, from more than 1,500 restaurants. Other winners include the world class ARIA in Sydney, the amazing Lucy Liu in Melbourne and Rockpool Bar and Grill also in Sydney. Everyone at the hotel is thrilled with this honour and to be in such great company. It is especially gratifying knowing the award comes directly from you guys, our diners. Thanks to everyone who have helped us earn this amazing accolade. Be sure to reserve in advance, now that the word is out. Your table is waiting!